With several albums to his name, internationally acclaimed musician Oliver Mtukudzi believes he is now releasing albums to educate the nation not for competition with other musicians. Though Mtukudzi is well travelled and still has an impact on the international scene, back home he is facing stiff competition from youngsters like Jah Prayzah. On Wednesday the superstar unveiled an album “Hany’aga/ Concern” that carries tracks with deep social meanings at his Pakare Paye Arts Centre in Norton. “We are not in competition with anyone but we release our songs to give the nation education about several societal issues. This album has a number of songs that have deeper meanings,” he said. Mtukudzi said he has tried to cover several aspects of life that include child marriages among others. It has songs “Haasati Aziva” “Wanza Sorry”, “Shiringinya” “Uchatinhei”, “Inombotangasei”, “Inyasha”, “Mahara”, “Matope”, “Bopopoto” and “Dehenya”. He said he consulted several other musicians in coming up with the list of the songs. 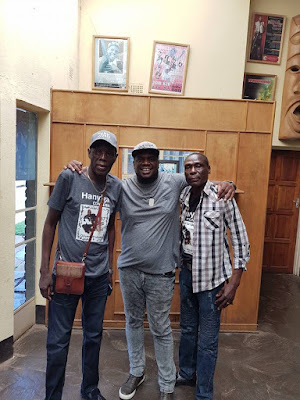 The album has the expertise of his former band members Munya Vhiyali, Sam Mtaure and Picky Kasamba who played a cameo role at the event yesterday. Present were several other musicians that include Mathias Mhere, Tocky Vibes, Suluman Chimbetu, Mbeu, Bob Nyabinde, sculptor Dominic Benhura and promoter Josh Hozheri among others. Musicians hailed the superstar for his album saying it gives a lot of lessons not only to the society but to fellow artistes. Tocky Vibes said he agreed with the superstar on the issue of competition. “I have learnt a big lesson that we should not be for competition only. We should fight to be champions of societal development through our music,” he said. Nyabinde said the superstar has shown that he is beyond a musician but a champion of behaviour change in society.